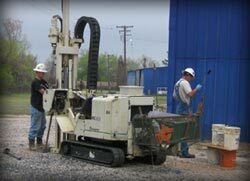 At SRP Environmental, LLC we strive to provide our clients with the most cost effective methods available for the assessment of affected soil and groundwater. We are able to provide such cost effective solutions because we have the equipment necessary to complete the job from start to finish. At SRP Environmental we know that having the proper equipment does not guarantee that the work is done properly or cost effectively, that is why we rely on our highly trained staff. Our staff members have conducted soil and groundwater assessments for contaminants ranging from fuels and oils to solvents and acids. From our seasoned field technicians to our highly qualified scientists and engineers, we ensure that the work is done right the first time and every time. It is our goal to collect the data necessary to properly characterize the site during the initial assessment and avoid making multiple trips to the site. That is why we strive to stay flexible, if unexpected conditions arise we have the resources necessary to adapt and modify the scope of services while the work is in progress, which results in a significant savings to our clients. No matter the class of contaminants present, we have the capabilities necessary to quickly identify and delineate the affected area. Give us a call to discuss the site assessment alternatives available at your site.